Introducing Xtensio for Business. New feature to save your own templates. Updated template channels. UX optimizations and more. Here are Xtensio product updates from August through October 2017. As you may know, we’ve been building Team Space over the past few months, a service our enterprise users have been demanding for ages. Team Space is a semi-white-labeled version of Xtensio, customized with your own logo and URL. It’s a perfect match for agencies and consultancies that manage multiple projects and navigate between both internal and external teams. Building the team and guest management process on a workflow platform that lets you collaborate in real-time and flexibly share links was no easy task, both technically and user experience design-wise. Yet, with the help of our early access Team Space users, we’ve been able to successfully launch Xtensio for Business for public use. Needless to say, most of our product updates from the past few months are related to this launch. These are free guests added to only 1 folio. 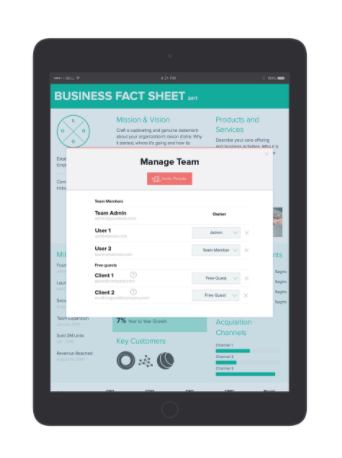 You can add 5 single folio guests per team member (e.g. 15 guests for a team of 3). This is perfect for looping in a client you’re working with on a single project or adding a prospective investor to see your pitch deck. These guests can be added to an unlimited number of folios but they can not create new ones. If you’re working with a client on multiple projects, this is a great option. It allows them to have editing access to all of the folios you’ve created for them but they will not be able to create any new projects themselves. This is your internal team. These users have access to all Xtensio Pro features. Team Members can create folios and they can add guests to individual folios via the ‘Add People’ icon at the top of the folio edit screen. Admins have the same access as team members plus the ability to add new members. They can also transfer folios outside the Team Space (e.g. to clients). This is the account the team is created by. The owner has admin access plus access to billing and the ability to delete the Team Space. This feature (requires Pro or Business plan) has been on our roadmap for awhile and finally made its debut coinciding with the launch of Team Space. It’s super useful for streamlining your workflow. Any folio you create can be saved as a template to reuse again and again. 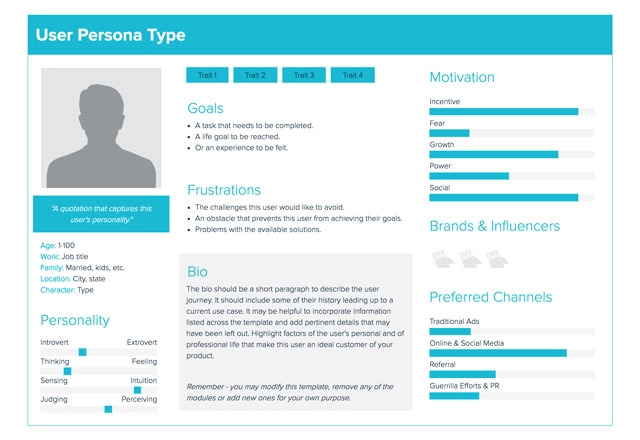 If you create User Personas or Competitive Analyses often, you can tweak our templates, add a section with your logo and company info and then save it as a template to reuse for yourself, among your internal team, or make it public and share it with the world. Under the 3-dot folio menu (both on the folio card on your dashboard view and at the top right of your edit view), you can now choose to Save as template. You will find all of your saved templates under the ‘Templates’ tab at the top of your dashboard. Learn how. As our template gallery continues to grow, we’ve realized that we needed a way to organize them to better fit the needs of our users. So we created toolboxes for every step of your process, from strategy and operations to bizdev and marketing. The ‘Templates’ tab on your dashboard now divides the templates into channels that are categorized by these different toolboxes. We’ve made Xtensio for Business super private and super secure. All folios transferred into Team Space stay within the Team Space. Only owners and admins can transfer folios outside of the space. All folios links are updated to the Team Space URL when transferred. Team Space users will have two dashboards and can switch between personal and Team Space dashboards via the profile menu. Implemented a single billing process for Team Space. Optimization of in-app and email communications to reflect changes to the platform. We’ve implemented image upload limits to ensure the quality and performance of your folios. The Free plan now has an upload limit of 1MB and all premium plans have an upload limit of 5MB. There were a couple of bug fixes related to collaboration, including a bug that was preventing the removal of a pending invitation and a bug that was preventing the folio card from appearing on a new users dashboard. We added an in-app notification to show when a template has been saved as a folio on a user’s dashboard. Updated UI on billing and pricing pages to clarify plans and prices. The bug causing folio cards to appear twice on the dashboard was also fixed. On presentation mode, there was an issue with the navigation icons not showing. That has been resolved. In the coming months, we’ll be optimizing communications and user experience along with ramping up our template creation process. Check back in December for more updates!